I used to have excellent penmanship. I remember using the very smallest micro-lead mechanical pencils and practicing on vellum with a lined guidesheet underneath, just for kicks. I liked using inkwells and pens with nibs, especially white ink on dark paper. I pored over manuals of calligraphy and typography with a watchful eye. Over the years, my handwriting has gone dramatically downhill. Nowadays, it's a near doctor-caliber catscratched scrawl. I type so much that I actually get a hand cramp when I address holiday cards. Embarrassing! I was surprised to discover that many of our local schools don't teach cursive until higher grades, if at all. Our school, thankfully, starts it pretty early. Jasper is still on block letters but will be learning cursive in kindergarten. Roo likes to write stories and make her own books. She has two distinct styles: the blocky handwriting she uses for quickly jotting down thoughts and the rather florid, loopy script she painstakingly executes on her important drawings and notes. Not that she doesn't like to text with ridiculous acronyms, of course, but at least she's still mostly analog for the time being and still stands a chance at growing up with reasonably attractive handwriting. 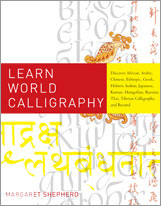 Calligraphy and handwriting is an inextricable part of national identity in many cultures. While the student is mastering this skill, she is also learning its importance in our history. By tracing it through Greek, Roman, Medieval, and Renaissance era, she can follow the flow of thought and form. Each area of the world reveals itself through how its people write. In a related discipline, learning to write longhand-whether it is introduced after learning separated letters or taught from the beginning-has been shown to create different pathways in the brain and encourage a different kind of thinking. As Emerson said about correspondence, "...for in a letter, we have not better things to say but surely say them better." A student who has hand-lettered a poem, like a student who has drawn a vase or sketched a face, has learned to see deeply and uniquely. Writing by hand still enables writers to express themselves and readers to respond to their ideas in ways that no other medium can provide. On January 23, 1737, John Hancock, whose name has become synonymous with the art of the signature, was born in Braintree, Massachusetts. Every year, the Writing Instrument Manufacturers Association (WIMA) sponsors National Handwriting Day on this date to remind Americans of the importance of handwriting. National Handwriting Day is the perfect time to close your laptop, dust off your pen, open you box of notecards and treat some friends to a real note from you. Maybe you could have thanked someone more warmly for a gift, or sent a proper "bread-and-butter letter" for hospitality? Ink on paper is the gold standard for saying thank you in ways that matter. National Handwriting Day might seem like the perfect day to wring your hands and bemoan the death of penmanship, especially if you're a grandparent who has given up waiting for thank-you notes from grandchildren for holiday gifts a few weeks ago. Don't! Whenever I hear this from grandparents, I ask them to think about how many thank you notes those children have ever received in their lives. How can you expect them to give someone else a treat they've never experienced themselves? Make it a project this year to send THEM a thank-you note, prompt and particular, for something they do for you. People sometimes tell me that they don't send anything in the mail anymore because they hate their handwriting. That's like saying you're going to wear a mask because you don't like your own face, or hire someone else to do your phone calls because you don't like your own voice. How you write and sound and look is you, and people who receive mail from you will be so blown away that critiquing your penmanship won't enter their heads. Provide yourself with nice stationery. Upgrade your pen. Warm up your arm [and get the ink flowing] with half a minute of repetitive swirls. And sit comfortably at a flat working surface with your writing arm supported. You'll be surprised how your writing will improve. In accordance to the FTC Guidelines and the WOMMA Code of Ethics, I am disclosing that most of this article, including the tips, came directly from a press release. I thought it was an interesting topic to share with my readers, however I will receive a free copy of the book pictured in return for posting and just wanted to let you know. All opinions are my own, as usual.